You will have a happy Chanukah when the blessings on the candles are said with this amazing Hanukkia – a magnificent example of sterling silver Judaica. One candle is lit on the first night of the Jewish holiday of Hanukkah, and each night another one is added, so by the eighth night all eight candles are lit. The custom of keeping all eight candles in one straight row has been enabled here by the scrupulous artisans of Hadad Bros. of Israel. The ninth candle is used for lighting the other candles; hence it is called the "Shamash" – "caretaker" or "servant" in Hebrew, and is placed out of the line of the eight candles. This Hanukkah Menorah is an amazing example of the fine art of Hadad Bros.: The base rests atop four ornately carved sterling silver legs. The base itself has twelve facets. The part attached to the legs is smooth, then becomes slightly narrower with a step which is also in smooth silver. The facets then each curves steeply upwards, etched with detailed scrollwork design. The facets above the legs are edged with a smooth silver band. Once the curve has become perpendicular, it is edged with another smooth band. Topping the band with an inward curve are twelve panels in the same scrollwork design, all narrowing inwards to make a narrow column. The bottom of the column is smooth, topped with a slightly wider ring, then a cup like base which holds a long stem of 12 panels all carved with scrollwork again. The stem narrows and then widens again. It narrows one more time before it starts climbing to the top of the Menorah and holding the arms. At this point, a specially designed hook holds a detachable chalice which can be used to fill up the candle cups with oil. The part of the stem which holds the arms is also carved with scrollwork, as are the cups which top the arms. The arms themselves each look like a half circle, with a silver decoration half way up each arm. The cups are naturally made for oil candles, but canalso hold wax candles. 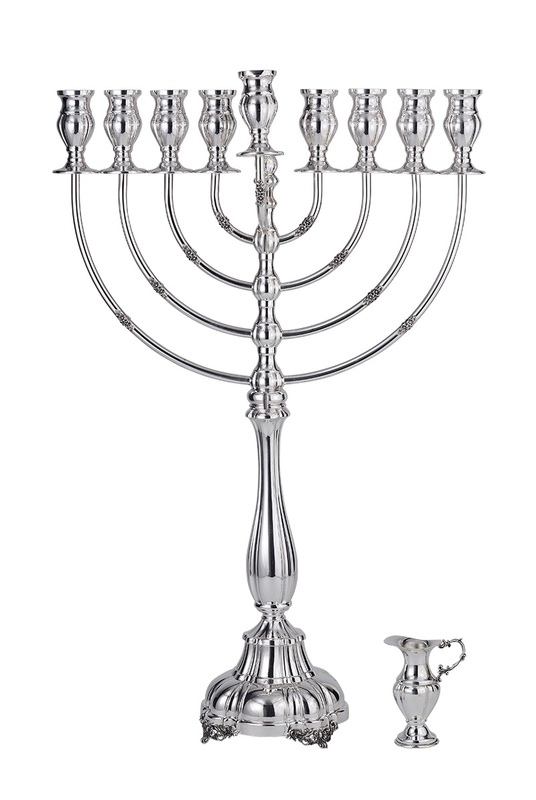 Let this beautiful and distinctive silver menorah grace your home with light and beauty on this Hanukkah, or give it as a unique gift. It is sure go grace any home for many years to come.